Home › Updates › Let’s March on a Million! Let’s March on a Million! We Can Do It for ME! We said last month that 2015 marks the 10th year of Invest in ME charity and the 10th of their world-renowned international biomedical research conferences. Well, February was a landmark month for the Let’s Do It for ME campaign. We raced past the milestone of £500,000 – yes, HALF A MILLION POUNDS! This has allowed Invest in ME to initiate possibly the two most important research projects for ME in the UK: a gut microbiota study in the Norwich Research Park with IFR/UEA and a project leading to a clinical trial of the rituximab drug in cooperation with UCL. 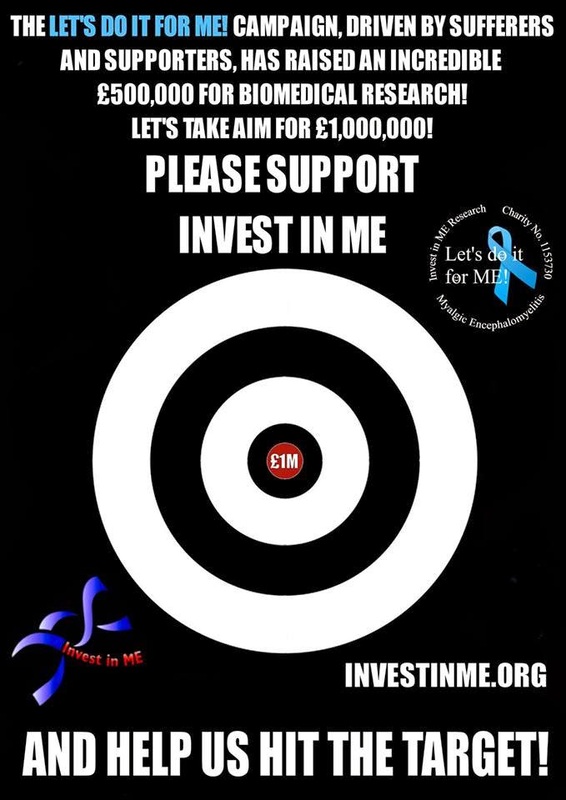 March 2015 begins with a total of £502,000 donated or raised or pledged for Invest in ME Biomedical Research Funds since we launched our campaign to help the charity fulfil its plans to establish a centre of excellence for ME (myalgic encephalomyelitis). This means we begin March at £502,000 on the way to the next target of a magic million! How fantastic would it be to reach £1m in May 2016? A wonderful way to help celebrate the 10th anniversary of Invest in ME Charity. Can we do it? With you and the help your equally amazing friends and families .. YES WE CAN! “The reason I’m so proud of one of the charities I support Invest In ME is because it’s run entirely by a few volunteers who themselves either suffer with the illness or are parents of children with ME. There are no salaries; every penny that’s raised goes where it should go and alongside the Lets Do It for ME team who are also voluntary, what they have achieved is nothing short of phenomenal. follow us on Twitter @Letsdoit4ME. Do let us know if you have plans or events you’d like us to highlight or any ways you’d like to help. Our email is: fundraising4me@gmail.com Ways to simply donate are at the end of this blog. Five years ago Invest in ME created a proposal for a Centre of Excellence for translational biomedical ME research. The centre would provide clinical assessment, diagnosis and treatment for patients and training and information for healthcare staff and work collaboratively with international researchers. With comparatively few resources the charity (all volunteers) and its supporters have established a foundation which could provide a real basis for future development and which will lead to better understanding and treatments for this physical illness. The model we have is, with enough support, able to continue and expand and augment and achieve a real breakthrough in ME research in UK and Europe and the world. Let’s Do It for ME is a patient-driven campaign to raise awareness and vital funds for the centre of excellence. The campaign was set up in 2011 and is run by ME patients who have the same objectives as the charity – high quality biomedical research resulting in a better understanding of the pathogenesis of ME as well as in the development of appropriate treatments. The campaign has supporters from all over the world and it has forced change through imaginative ideas, selfless efforts, dedication and positivity – a Can Do approach to a disease where so many have suffered unnecessarily for too long. Together we are trying to improve the future for people with ME and their families and after reaching a milestone of £1/2 MILLION we are ready to reach our next target of £1 MILLION. Our thanks go to the patients and their carers and friends and relatives who have campaigned for change and forced action to be taken and please join us in reaching our next target. With enough support we can change things forever. One small charity, one BIG Cause, one band of supporters – progress – change. “Things do not have to be the way they are – we can change things.” – Dr Ian Gibson. Let’s Do Change. Let’s Do It for ME. UPDATE Now Over £600k on Our Way to a Million! ← Matched March Donations Offer!